NOTE: We have stretched the boundaries of this page to bring you larger images. Please excuse the odd appearance of this page. We stretched it to enable you to see rather large images. The exact charts used by the National Hurricane Center (NHC) are available for download from the NHC here. Select "Atlantic" and you're good to go. You can print out the chart and use it repeatedly, or simply print a bunch of them and use one for each storm that may approach an area of interest -- like, SXM. Bear in mind that this hurricane season may well be frontloaded — so you might want to print a few of these now and not save doing that for later. website as your primary source of information. Always heed advisories from local authorities. 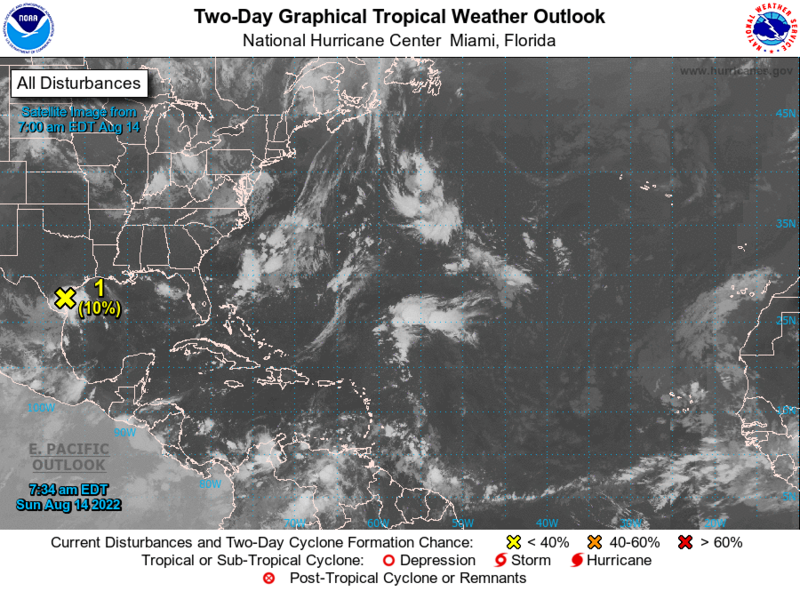 During hurricane season, see meteorologist Rob Lightbown's Atlantic Tropical Weather Discussion & Advisories at www.crownweather.com. The small fee is well worth it. The above observation from Cole Bay is live and real-time and usually works. .
More on hurricane names is here. Names will change to boldface as named storms form. The 2018 hurricane season begins June 1 and ends November 30. If there are no current storms, the most recent storm still appears. 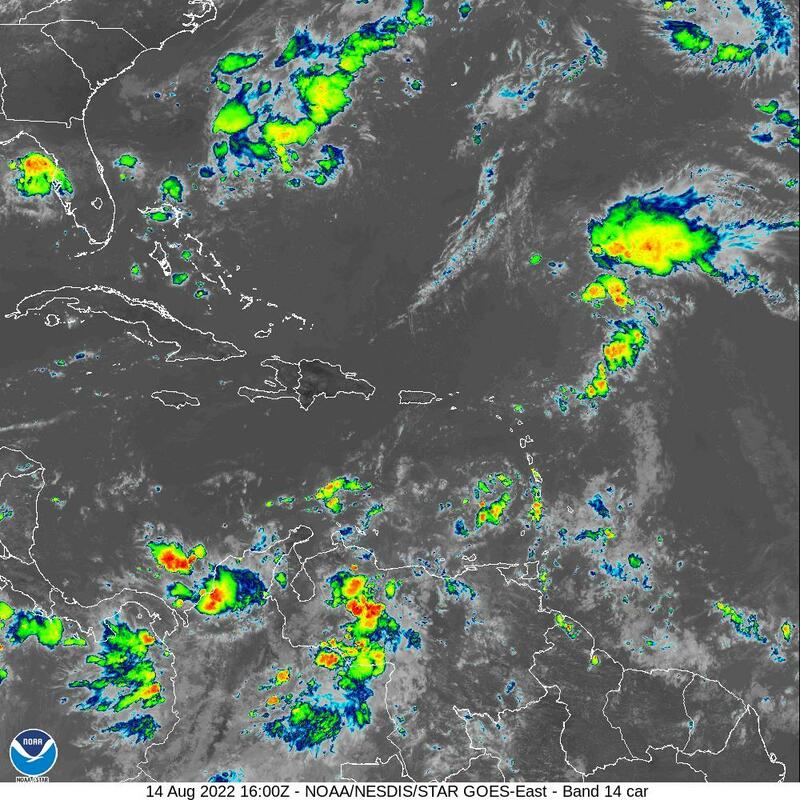 Current Weather Images: All maps are satellite images, updated as frequently as every half hour, courtesy of NOAA unless otherwise noted. 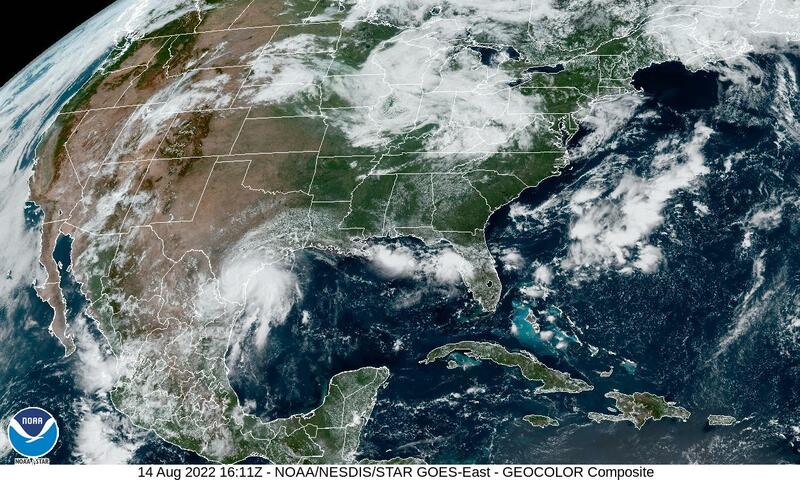 If you see no images, the NOAA server is down. GMT). If the time hasn't changed since you last viewed the image, click your browser's REFRESH button. Then you'll get the new image. Again, if an image fails to appear here, the weather site is down. To return here after visiting any page on another site, click the "back" button on your browser. that because there is none from NOAA at the moment. 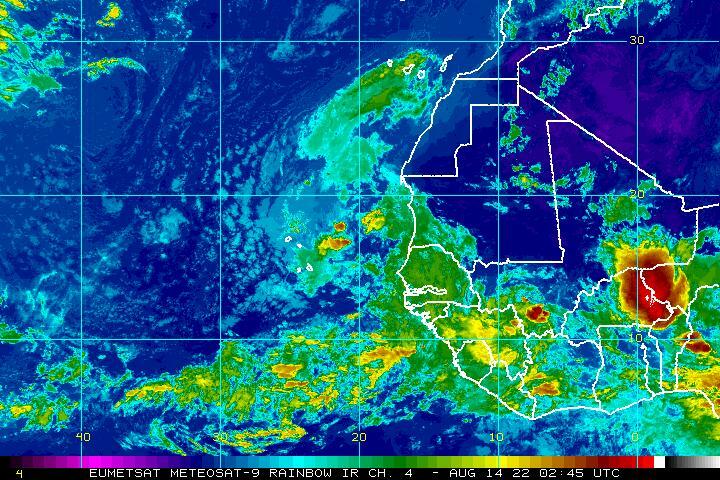 Storms Crossing Africa East to West . 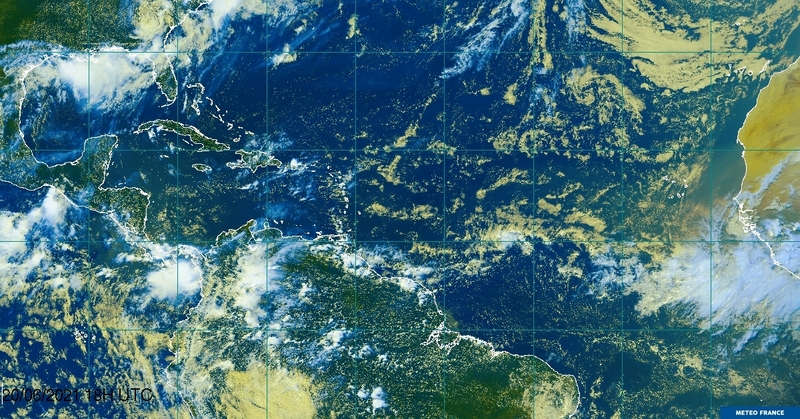 . .
west just north of the "Intertropical Convergence Zone" (ITCZ). Focus on storms between 10 and 20 degrees north.... 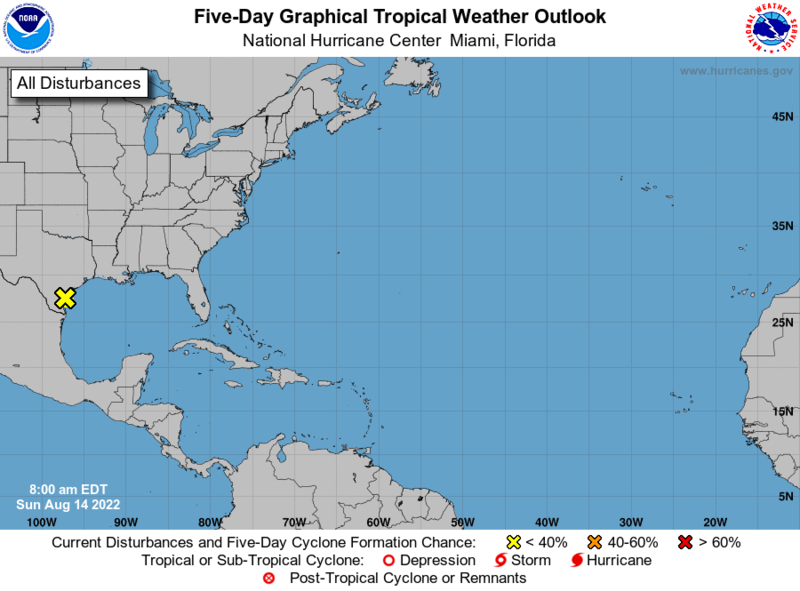 Starting in late July, "shearing"
winds over the tropical Atlantic begin to diminish, heralding the beginning of the Cape Verde season. Its peak is September. Satellite photos update constantly. Why is this significant? Storms encountering dry air tend to lose strength; those traveling in moist air can maintain or gain strength, depending on other conditions. Graphic content courtesy NOAA unless otherwise indicated. Images updated 24/7/365.